So we are introduced to Morgause, who will have a major impact, for a good long time, on Camelot, Uther, Merlin, Gaius, Gwen, and most of all, Morgana. The relationship between Arthur and his father is center stage. Morgana takes another huge step in her journey to the dark side. Only she’s not aware of it yet. She’s not aware of how much this woman, whom we meet here, is going to affect her future. 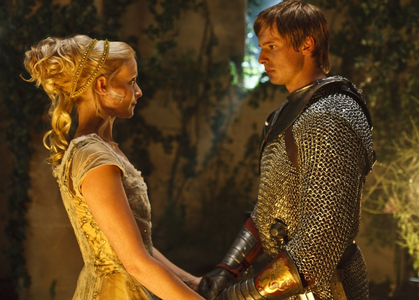 + Please give your thoughts on what you thought of the initial relationship of Morgana and Morgause. Do you think there was a strong bond from the beginning? + Any plot holes? Maybe it’s just me, but do you think that was reasonable that a person would come uninvited to the castle during a knighting ceremony, kill several knights, challenge the prince, and then be given a nice room to stay in? I mean, other than Gaius who in the world knew who she was or what she was up to? I don’t know, that didn’t fit IMO. But of course, they had to have the thing with her and Morgana, sooo that’s how they did it. +What did you think of the scene with Arthur and his mother? Did you like her? Did she seem motherly? Did you feel at all like I did that he should have been more suspicious? Didn’t she say too much, too quickly? What part of what she said was not true? I forget. I know most of it was, right? + The Arthur/Uther confrontation: One of the best acted scenes in Merlin ever (next to Arthur/Gwen 4.09). Want to discuss how you felt about the whole scene? When Arthur saw his mother. I just love the expression on his face and all that it means to him. Also, I loved when he confronted Uther about it. Well, I felt really bad for Arthur when he was feeling all miserable and embarassed by being beaten by a girl. However, I wouldn't say it was the worst moment. Arthur: This is what fuels your hatred for those who practise magic. Rather than blame yourself for what you did, you blame them. (...)Arthur: You have hunted her kind like animals! How many hundreds have you condemned to death to ease your guilt? Uther: Those who practise magic will stop at nothing to destroy us. I have only done what is necessary to protect this kingdom! 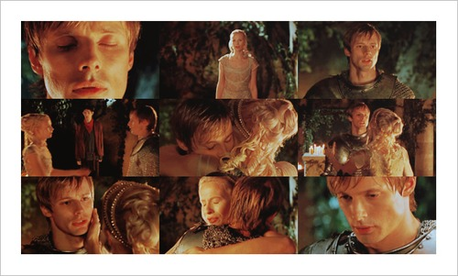 Arthur: You speak of honour and nobility. You are nothing but a hypocrite and a liar! Uther: I swear on my life. I loved your mother. There isn't a day that passes that I don't wish she were still alive. I could never have done anything to hurt her. My son. You mean more to me than anything. Morgause was a decent villian. My opinion of her is divided. Sometimes I like her, sometimes I don't. Here she gave us an opportunity to see emotional side of Arthur and Uther and I absolutely loved it! Arthur. He had a soft spot for his mother and Morgause took advantage of it. But what I loved is that he showed that his attitude towards magic wasn't as strickt as Uther's. And that he had courage to stand against him and defend his mother's honour. He spoke the truth and he was sooo on point. I thought that was amazing!! His acting was phenomenal!! Arthur and Uther. They spent their whole life saying nothing on that matter. Now, Morgause has made them talk. Almost as if she weren't the villian. That conversation bonded them. I liked this episode. It was dynamic and interesting. -->Yes, of course. Morgause knew she was her sister and therefore acted like that. Morgana didn't know, but I believe she felt something. And even if she didn't, Morgause helped her with her worst problem: nightmares. So she felt grateful. But there was defintely strong bond. Like the one with Mordred. -->That was an absolute plot hole. It didn't make any sense at all. Even more than that, it was ridiculously stupid. I think it medieval RL, that person would lose his head in a matter of seconds. They certainly wouldn't be given a nice cosy room. Other than that, I don't think there were many other big plot holes. ---> I am conficted about this scene. I liked his mom. I wish we saw more of their relationship ( which was impossible, I know). He should have been more suspicious. But when you grow up with so many unanswered questions, at some point you won't care what sources you use, as long as you find something out. She gave him that chance and he gladly took it. But we don't know was that really Ygraine or only Morgause's "projection" that used her words. I like to believe it was really Ygraine. But on the other hand, I do not believe she would have said those things, or in that way. 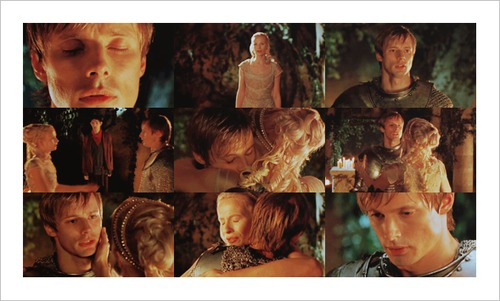 She most likely loved Uther, as much as he did her. And to have only one opportunity to talk to her son and to only mire Uther, it didn't make much sense. Even though she told him the truth about his birth ( that he was born of magic) she lied saying that Uther knew the cost of it. Maybe, the real Ygraine really believed that in the end. We will never know. -->I agree, it was one of the best acted scenes and that is why it is one of my favorites. It is so deep on so many levels. "According to Bradley James, the crew was really understanding of his need to go away, be on his own and get ready for the emotional scene with Anthony Head. Anthony Head got emotional at the end of the fighting scene between Uther and Arthur." I would die to see BTS!!! Back to discussion: Arthur came in without any hesitation. He was so angry at Uther. Uther, on the other hand, still tried to convice Arthur that it was all a lie. But Arthur didn't believe him. He showed he was more mature here than in some scenes in the later seasons. He got to the core of the problem, Uther's guilt and consequent tyranny. He was ready to kill him; which he would regret his whole life. Merlin knew this of course, so he stopped him. What I thought was interesting is that Uther didn't deny that he used magic and that Arthur wasn't born of it. He only said that he could never have done anything to hurt her. That is why I believe that Arthur knew the truth. The real truth about his birth. My favorite detail about that scene is when Uther kissed Arthur in the head and told him that he meant more to him than anything. It was a beautiful moment.